Great Indian Film and Literature Festival (GIFLIF) will be celebrating its 3rd edition, in DLF Cyber Hub, Gurgaon from 2nd to 4th of December. We speak with Karan Kukreja, Divank Rastogi and Amit Sinha from GIFLIF team as they prepare for their innings in the big league. The 2nd chapter in Gurgaon, shall include a play and a music concert, in addition to a plethora of panel discussions on themes hovering around film writing, filmmaking, digital media, advertising, publishing, literature, script writing, and film screenings, as well as cultural stimulants like book readings, Kavi sammelan, and a poetry contest. “The panellists gracing the occasion would be Padma Vibhushan and Dada Saheb Phalke Winner Adoor Gopalakrishnan, Subhash Ghai, Prakash Jha, Padma Bhushan Ruskin Bond, Kiran Nagarkar, Piyush Mishra, Raj Shekhar (Lyricist- Tanu Weds Manu), Rajat Kapoor, Vinay Pathak, Juhi Chaturvedi (Writer- Piku and Vicky Donor), Major General GD Bakshi, Anjum Rajabali, (Writer- Rajneeti , Aarakshan), Annurag Batra, Anand Neelakantan, Sharat Katariya (Director- Dum Laga Ke haisha), Rajkumar Gupta (Director- No One killed Jessica, Aamir), Rahul Rouhsan (Founder- faking News), Arunabh (Founder- The Viral Fever), Surendra Sharma (renowned Poet), Dr. Sita Sagar and many more,” informed Karan Kukreja, co-founder, of the GIFLIF team. “It is also important to mention that we would be conduting a preliminary round of Poetry contest in Rapid Metro at Gurgaon on 13th November 2016, which in itself will be a unique attempt,” he added. Divank Rastogi, Head Digital and Operations, also outlined treats to look out for in the evenings—a play directed by Rajat Kapoor, a performance of poetry on guitar by Raj Sekhar, and the launch of “Ballimaaraan” - a Piyush Mishra band, to name a few. 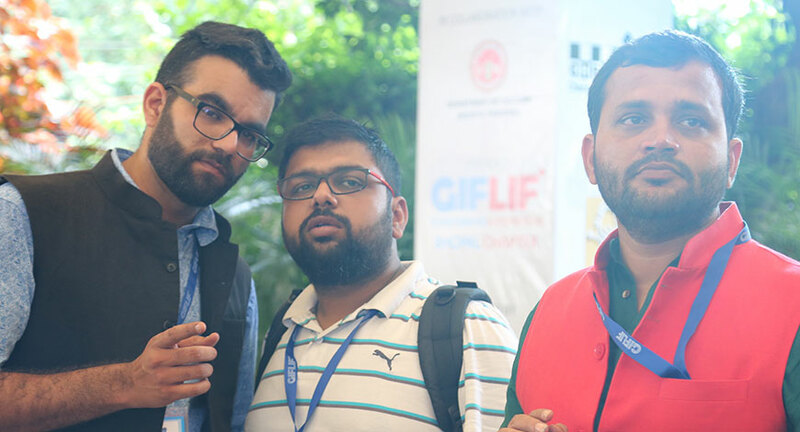 GIFLIF was started in 2015, from Gurgaon. “Film and literature festivals were happening in isolation and we thought about creating a synergy of both the forms of expression and expected it to create new bridges in connecting people and an entertainment value with intellectual stimulation at the core, said Kumar Amit Sinha, co-founder, GIFLIF team, speaking of the vision behind the festival. The 2nd edition of the festival was hosted in Bhopal earlier this year (September). Having started out originally as Gurgaon International Film and Literature Festival, it was later rechristened to The Great Indian Film and Literature Festival, as the team realized that the independent film makers and writers from smaller towns are not really exposed to such events, though there was immense potential. “This prompted us to take GIFLIF to smaller destinations covering the 4 corners and central India, said Amit. Therefore, by the year 2020, GIFLIF has planned to have 20 editions with 6 running chapters in Gurgaon, Bhopal, Jammu and Kashmir, Shillong and Kanyakumari. In spite of being a relatively young IP, GIFLIF has on board a very distinguished association of patrons and advisors, which include names like Ravi Sharma, Shyam Benegal, Anurag Batra, Subhash Ghai, Deepak Mahaan and Sumita Mishra. “We had a few acquaintances who helped us connect with some in the industry, but largely it was based on the merit of the idea,” said Amit. With the first two editions being graced by stalwarts like, Gulzar, Shabana azmi, Piyush Mishra, Subhash Ghai, and many other renowned personalities in the sector, GIFLIF saw a combined footfall of 18000, and about 20 million impressions on Facebook. “The experience from both the previous editions has been overwhelming and involved a lot of learning. This time we are adding new elements such as play, a session around comics (which is going in oblivion). We have realised that there is a huge audience for these subjects, its just that we need to take the message to them. We are expecting double the audience this time in Gurgaon, compared to the previous Gurgaon edition,” said Karan. The main segment of the crowd being people in the age group of 18- 55, the organizers have explored different channels to reach out to the potential audience , including digital and online platforms, radio, print advertisements, news coverage, promotion at selective colleges, pre event activities, outdoor advertising and promotion at various outlets of partners. Though the beginning was a rough sail, with only few corporate houses warming up to the idea, GIFLIF is now treading safe waters, with SBI Card (title sponsor), Maruti Suzuki, DLF, Govt. Of Madhya Pradesh (Department of culture), AISECT University, Department of tourism (MP), Ola, Chaayos, Exchange4media, Screen Writers Association, Chai Point, Whistling Woods international, Pocket Films etc. on the board of sponsors. “So far both the first chapters – Gurgaon and Bhopal - have achieved the break even. GIFLIF – Bhopal Chapter expenditure crosses the 1 crore mark,” revealed Karan. “GIFLIF has two long term agendas. First is connecting India with brand GIFLIF and second is connecting India with the world via the string of Film and Literature, “said Amit, speaking of future plans. The J&K chapter is likely to be initiated in March/ April next year, another step towards the maker’s vision of culminating at a mega conclave in Kanyakumari in 2021, which also has a symbolic value attached to Indian sub-continent where merger of three oceans – Arabian sea, Indian Ocean and Bay of Bengal happens.”Where majority of the festivals have attached international as prefix or suffix – we have added Indian to the context because we believe that the coming decade belongs to India and Indian has more international connotation and appeal to it. The next five year plan would be to take GIFLIF to different continents” added Amit.